Won't you while away the hours with us? Euan and Spanky like a lot of things. They also like to talk about a lot of things. 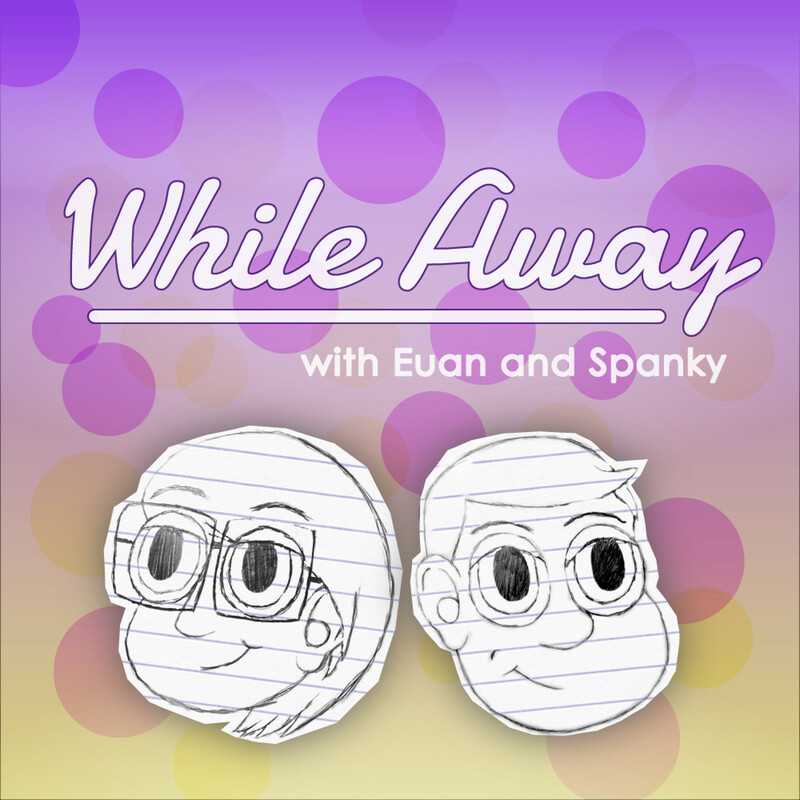 While Away is a variety podcast with segments dedicated to specific discussions. Wanna hear their takes on movies? Check out Popcorn Corner! Or maybe you want to hear a defense of something that is typically hated? One Man's Trash is the segment you're looking for. There are many more segments and special guests and other nice things inside. So, whaddya say, let us While Away the hours with you? We're selling out and creating a cinematic universe this month. Also, Euan likes princesses. This month's episode features: Popcorn Corner, Cartoon Crunch, and Stream Crossers. Popcorn Corner ( 6:12 ) - It's a Solo Podcast! Not like a solo-podcast (there's still two of us) but we're talking about Solo: A Star Wars Movie! Cartoon Crunch ( 51:41 ) - We watched a cartoon FOR THE HONOR OF GRAYSKULL! She-Ra She-Ra! She-Raaaaaa! (Go look up the She-Ra 80's theme if you haven't, it's great). Stream Crossers ( 1:26:28 ) - Where to start with this one... It was kind of a trip inspired by the upcoming Spider-Man Into The Spider-Verse and we accidentally made our own cinematic universe. Enjoy..? SPOOOOKY! Well, sorta. We talk about movies a lot this month, most of which are scary in some way. This month's episode features: Popcorn Corner, and Freestyle. Popcorn Corner ( 4:40, 51:08 ) - Spookoween double feature time! Venom is a monster and monsters are scary. You know what else is scary? Eighth Grade. We discuss both of these movies this month. Freestyle ( 1:37:25 ) - We really wanted to talk about a lot of our favourite Spookoween movies this month... So we did! We're joined by a special guest this week! TJ (@mayofmay84 on Twitter) from the Born In The Eighties podcast pops in to talk about Final Fantasy 8. This month's episode features: Cartoon Crunch, and One Man's Trash. Cartoon Crunch ( 2:25 ) - Back in the nineties I was in a very famous TV show. That's not true. Bojack Horseman (the horse) however was in a very famous TV show and this month we talk about Bojack Horseman (the show) in Cartoon Crunch. One Man's Trash ( 41:54 ) - Joined by a special guest, Spanky delights in talking about TJ's trash (Final Fantasy 8) while Euan wishes he were anywhere else but on this podcast. Fun! More new things! Cartoons are good! This month's episode features: Popcorn Corner, Cartoon Crunch, and Science Function. Popcorn Corner ( 5:19 ) - Euan and Spanky GO! to the movies and see Teen Titans GO! To The Movies and then talk about Teen Titans GO! To The Movies... which we saw... at the movies. Cartoon Crunch ( 1:06:30 ) - Talkin bout toons! This month we talked about Camp Camp! Science Function ( 1:37:10 ) - New segment time! We make a science fiction movie using randomly generated pieces! Podcasts are hard to make apparently, so this episode is super late but we've got a new segment and some really fun stuff. This month's episode features: Popcorn Corner, The D-Pad, and Freestyle. Popcorn Corner ( 9:53 ) - Euan and Spanky use this segment to talk about movies of all sorts; old and new. This month we discuss the ever-topical Looney Tunes: Back In Action. The D-Pad ( 48:55 ) - Video games! We recorded our thoughts for E3 and they're completely irrelevant now but hey, everything we talk about is irrelevant so we stuck it in anyway! Freestyle ( 1:53:29 ) - "The Generic Podcast Segment". Euan and Spanky usually do a pretty good job of having a purpose for their segments. Spanky usually ignores it and talks about Kingdom Hearts. This segment is specifically designed to have no purpose, so they can't possibly get sidetracked (that doesn't mean they won't try, though). Trying some new things this month, also a lot of movie talk. This month's episode features: Diplomatic Deception, Stream Crossers and Popcorn Corner. Diplomatic Deception ( 4:20 ) - It's our quiz-show style game where we try to bamboozle the other host with facts (or lies) about our home countries. This month we played with the formula a bit to see what directions we could take the show in the future. Stream Crossers ( 42:20 ) - Our first edition of Stream Crossers in which we pitch crossovers! This time we see Mr. Bean as an ever-evolving final boss style of deity as well as Kingdom Hearts, already known for being a crossover series, making a crossover appearance with a childrens show which also likes to dive into crossovers. It's crossover-ception?! Popcorn Corner ( 1:10:18 ) - Euan and Spanky use this segment to talk about movies of all sorts; old and new. We did a double feature this time around, enjoy our discussions of Pacific Rim Uprising and Ready Player One. In this episode there is laughter, there is loss, and there is heartbeak. This month's episode features: The D-Pad, Cartoon Crunch, and Popcorn Corner. The D-Pad ( 4:18 ) - "Video games are bad!" exclaims Spanky. Yep, this segment is about video games, a thing which Spanky has experience with but generally doesn't like except Paper Mario for the Nintendo 64, which is the only good game (don't take Spanky too seriously, he's silly). This episode's game is Life Is Strange and Life is Strange: Before the Storm. Cartoon Crunch ( 55:42 ) - Cartoons! Pretty simple, this segment is just us talking about a cartoon or maybe several cartoons. This month we're discussing Craig of the Creek. Popcorn Corner ( 1:25:56 ) - Euan and Spanky use this segment to talk about movies of all sorts; old and new. This is the segment where heartbreak happens. We discuss Avengers: Infinity War. The first episode of our nice little monthly long-form variety podcast. This month's episode features: Diplomatic Deception, One Man's Trash, and Popcorn Corner. Diplomatic Deception ( 1:54 ) - One host tries to hoodwink the other in this gameshow-style segment using obscure facts about our home countries. This episode's question is Weekend at Frosty's. One Man's Trash ( 22:36 ) - Sometimes we, as humans, like things that basically nobody else does. This segment is dedicated to giving a platform to people who want to defend a piece of media that, despite being hated by most, is near and dear to their heart. This month features special guest: DemonTomatoDave! Popcorn Corner ( 1:35:55 ) - Movies! Euan and Spanky use this segment to talk about movies of all sorts; old and new. First up is Star Wars: The Last Jedi.